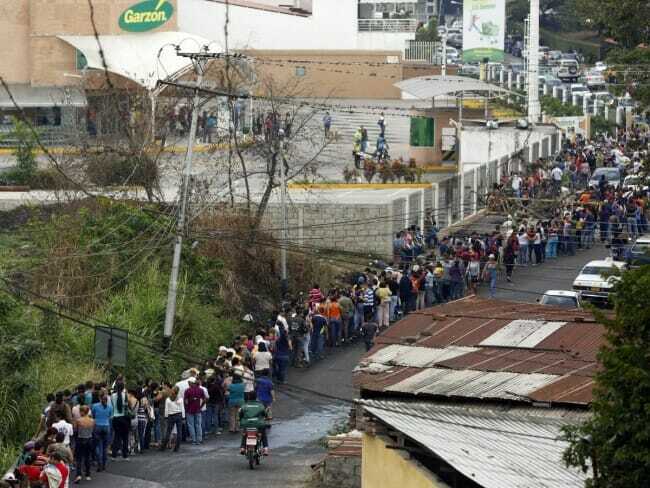 “In the black market you have to pay 110 bolivares [$0.50] for a roll of toilet paper that usually costs 17 bolivares [$ 0.08] in the supermarket,” Camacho told Fusion. “We don’t want to participate in the corruption of the black market, and I don’t have four hours a day to line up for toilet paper” at a supermarket…. I see this all the time, the notion there is somehow a "correct" price that no one is willing to charge. There is nothing real about the 17 bolivares price. It is a fiction. There are only two real prices in the market -- 110 bolivares PLUS any risk/penalty from breaking the law or 17 bolivares PLUS 4 hours of your personal time. My sense is that if the legal risk of buying on the black market is low, and you knew the average order size and the value people placed on their own time, you would find these two prices converging. 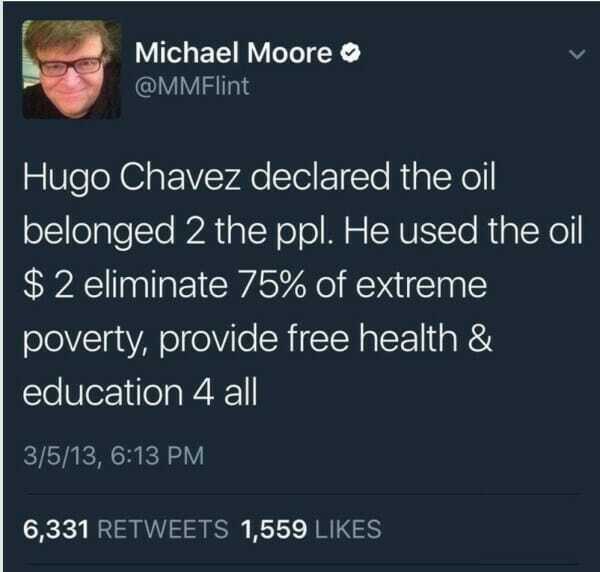 But in any case, it is dumb to continue to insist that 17 bolivares is the "right" price. This is not the way it was supposed to be. Venezuela is one of the world's great energy powers. Its oil reserves are among the world's largest and its hydroelectric plants are among the most potent. Venezuelan President Hugo Chavez told the military and civil militias today to prepare for war as a deterrent to a U.S.-led attack after American troops gained access to military bases in neighboring Colombia. Chavez said a recently signed agreement that gives American troops access to seven Colombian bases is a direct threat to his oil-exporting country. Colombia has handed over its sovereignty to the U.S. with the deal, he said. "Generals of the armed forces, the best way to avoid a war is to prepare for one," Chavez said in comments on state television during his weekly "Alo Presidente" program. "Colombia handed over their country and is now another state of the union. Don't make the mistake of attacking: Venezuela is willing to do anything." Dictator play book page 1, paragraph 1: When domestic situation goes bad, find an external enemy. Over the last year or so, I have been relatively optimistic for a relatively significant drop in oil prices over the next 2-4 years followed by a number of years of price stability at this lower level. This would be a direct analog to what happened in the 80's after the 1978 oil price spike. pre-revolutionary head count of 32,000 employees has grown to 112,000.
in their oil productivity soon. I am coming around to this argument. I still think that oil prices are set for a fall, but lower prices may not last long if this analysis is correct. Update: Of course Maxine Waters would like to add the United States to this list of countries with incompetent government management of oil reserves. Its odd to me that from time to time we go through periods of angst (e.g. the late 1980s panic that the Japanese were "buying up America") about this effect, but we should instead be assured by this vote of confidence from the rest of the world. One might argue that folks are simply buying US assets today because they are cheap, and certainly the dollar's fall makes US assets relatively less expensive. But assets are cheap in Russia and Nigeria and Venezuela too, and you don't see the world rushing to invest a few trillion dollars in those locales. 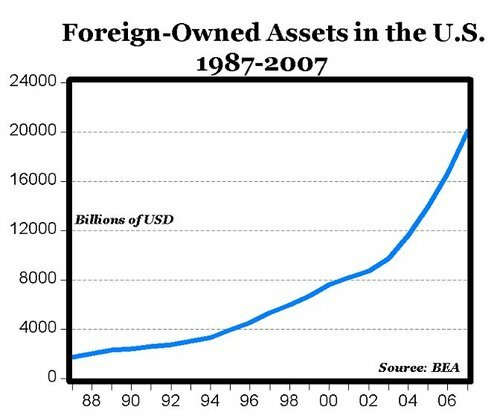 Postscript: This foreign ownership of US assets also makes the world a more stable place. I am always stunned when people argue that Chinese ownership of a trillion dollars of US debt securities gives them power over us. Huh? Since when does holding someone's debt give you power? I don't think Countrywide Mortgage is feeling too powerful today. The fact is that holding our debt and owning US assets gives China (and other nations) a huge shared interest in our stbility and continued prosperity. I am on the road this week, and still do not have time to write the post I want to write about Obama demagoguing against oil companies. Fortunately, I do not have to, because Q&O has this post. Here is the short answer: companies like ExxonMobil, even in the best of times (or most rapacious, as your perspective might be), makes 9-10% pre-tax profit on sales. They make something like 5-6% when things are not so good. This means that if gas prices are $3, when you take out the 45 cents or so of tax, Exxon is making between 13 and 25 cents a gallon profit. Call it 20 cents on average. So, wiping out profits completely with various ill-advised taxes or regulations would achieve the substantial goal of ... cutting about twenty cents off the price of gas, or about $2.50 off the price of a fill-up. Of course, that is at the cost of eliminating all investment incentives in the world's most capital intensive resource extraction business. Which in turn will mean that that price cut will last for about 2 years, and then be swamped by price increases from disappearing gas supplies (exactly what happened in the late 1970s). Part of the problem is that most people do not understand the supply chain in crude oil. It would seem logical that if the price of oil rises form $30 to $100, then all that $70 price increase is pure profit to Exxon. That would have been true in 1905, but is not true today. Exxon, even when it does the exploration and drilling, gets its oil via complicated agreements with state-owned corporations which in the main are structured so that the country in question, and not Exxon, gets windfall. This means that if Obama wants to tax windfall profits, he needs to seek out Venezuela and China and Saudi Arabia. The article covers all this and more.